Felipe has lived most of his life in Colombia and Ecuador. He compares both. Katia: Hello Felipe, how are you? Katia: Listen, I was thinking you know a lot about Ecuador and Colombia right? Katia: What is it that you like about those two countries or what is it that you don't like that much or what would you like to change? Felipe: Well, what I really love of both countries is nature because, you know, my hobby is mountain climbing so I enjoy climbing high mountains in both countries because you have that, you know that in Colombia and Ecuador there is the highlands and you have really, really high mountains so I enjoy that. And also let's say one thing that I don't like is that cities are too big, you know, and if you get lost, if you travel to Bogot·, it's huge so I don't like cities in Colombia because they're so big, they're huge and you get lost. Katia: What about in Ecuador? 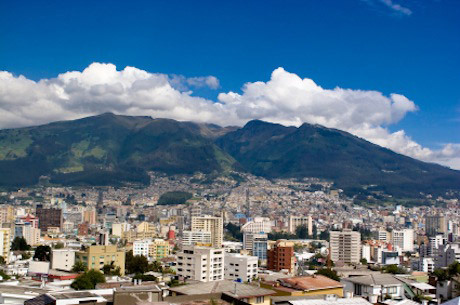 Quito, is it also a big city? Felipe: Well it is a big city but it's not as big as Bogot·. If you think, you can travel from the south to the north in a couple of hours, maybe two hours, it's not that huge as Bogot·. Katia: That is so interesting. What about something that you would like to change perhaps of Ecuador or Colombia? Felipe: Well, the only thing I would like to change is something about tourism because you know that people overseas outside of Colombia and Ecuador, they don't know too much about Colombia and Ecuador. So I don't know, I think the government should, you know, make people overseas know more about Colombia and Ecuador so that we can attract more tourists to our countries. Katia: That is so true. Actually just by knowing more I want to go to Ecuador and Colombia. Felipe: There you are, that's great. Katia: So thank you Felipe. Sometimes cities are too big, and you get lost. It's almost impossible to get lost around here. I get lost a lot when I first move to a new city. What is something you would like to change, perhaps of Ecuador or Colombia? I was going to go for a bike ride or perhaps a run this afternoon. Perhaps you should go to the doctor. You sound really sick. I don't like cities in Colombia because they are so big; they're huge. This sweater is a size medium, but it's huge. It's impossible to understand how huge the ocean really is. People overseas don't know much about Colombia or Ecuador. We are going on an overseas honeymoon next month. She has been living overseas for most of the last 15 years. There you are; that's great. There you are. Have a nice day. I have the books that you wanted to borrow, so there you are. Todd and Julia talk about outsourcing. Felipe compares Colombia and Ecuador. Life in Colombia and Ecuador. Capetown and the surrounding areas. Peter talks about South African climates. We were late to the surprise party, because we got on the way here. We're going out for dinner and for a movie after that.
. Now you have all the information you need. Do you have a lot of contact with people ? Your dog is this big and he is only a puppy?! He is going to be .